Mina Ghofrani Esfahani, a May 2018 graduate of the Master of Science in Integrated Marketing Communication (IMC) Program, launched a crowdfunded campaign to save a critically ill Iranian child, raising over $700,000 for 9-month-old Radin in just 6 weeks. Baby Radin, the child of Esfahani’s former colleague, developed type 1 spinal muscular atrophy, a genetic disorder which affects the nerve cells that control voluntary muscles, complicating breathing and eating. Esfahani’s social media savvy perfectly dovetailed with an urgent need for financial support in a time of dire health issues. I asked Ms. Esfahani a few questions about her IMC career and her campaign for Radin. Mina Ghofrani Esfahani: “When I noticed the problem and the difficult path to seek help and get access to medication, the first thing that came to my mind was that, money-wise, comparing the value of the currencies, this huge fund can only be collected in dollars not rials. And the best way to do it is through social media. I was familiar with crowdfunding and microfunding, and had previously donated to medical causes in GoFundMe and Facebook Fundraiser. So, bingo!! [In IMC] we learned a lot about Persuasion, Human Need Analysis and Consumer Behavior and Branding. I was reading lots of articles and books on Persuasion and Branding and they clicked many ideas and inspirations in my mind and heart how to be real, trustworthy, convincing and inspirational to start the momentum and be able to manage the momentum to the last point. Well, go figure! All the effort worked! The campaign was my brain child and a brand with its own characteristic features! I had my own principles of what content must be posted (and what not), in what time intervals considering the momentum flowing in the campaign. I started with my own friends; they trusted and added their own and the ball kept rolling. Every invitee was an ambassador for this cause. Many of them donated, many spread the word and it went viral within our community abroad. There were almost 22,000 donors and more than 120,000 invitees to the campaign. We were so lucky to have donors from 37 countries. I was amazed by all the compassionate people that invested their time, energy and money for this and helped me do that. I can’t thank them enough, and would always be proud to be the initiator and a part of this in my lifetime. Mina Ghofrani Esfahani: “I had a Master’s degree in TEFL (Teaching of English as a Foreign Language) and Applied Linguistics. I was an English teacher for almost 13 years and an adjunct instructor in university for almost 2.5 years back in my home country of Iran. But I always had a desire to study marketing and communications. Upon my arrival to the US, I headed directly to Oxford because my spouse was a University of Mississippi Ph.D. student in Business Administration with Emphasis in Marketing. I searched to find a major that was in line with my desires. I first sought to apply for the Ph.D. in Business Administration (Marketing) and MBA. Meanwhile, I found out about IMC and did not hesitate to reach out to Dr. Magee, the program director, to apply. He kindly advised me about the major and I was admitted quickly. “Of course as an international entering the US, I had to pass through the legal hoops to change my visa status from a student-dependent to a student visa. All in all, I couldn’t start my studies in Fall 2016, but started in the spring semester 2017 and had a wonderful path. 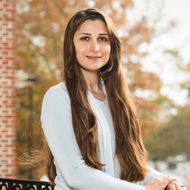 Mina Ghofrani Esfahani: “As a graduate student, in Spring semester 2017, I was a teaching assistant and research assistant for Professor Chris Canty Sparks who is very knowledgeable, positive, energetic and proactive in research in industry and marketing. For Fall 2017 and Spring 2018 semesters, I was a research assistant for Dr. Kristen Alley Swain, who is an astute professor and published researcher in academia for health and science communications. She was on my thesis committee, as well. Dr. Robert Magee has always been my “go to” person, both as a professor and thesis adviser. I learned a lot from him, his professionalism, modesty and dominance in the field. I owe him a lot for his consultations. Moreover, I was very lucky to have Dean Will Norton on my thesis committee. His insightful comments and outstanding experience in Communications, Media and Journalism encourage me a lot to hopefully pursue my higher education for a Ph.D. in the field. “Regarding the job search, depending on their interest and background, IMC students can have a plethora of options to choose from to be designers, digital graphic associates, social media associates/directors, industries account executives, account planners, etc. There are wonderful internship opportunities as well. In Summer 2018, I worked as a digital analytics intern for C Spire working with Google Analytics, SessionCam, AppSee, ForeSee, etc. The team was wonderful. After defending my thesis and starting my job search, while waiting for my legal work authorization process, my interest in data analytics, media research and marketing analytics led me to my current position as Research Analyst at Fox40 WDBD in Jackson, Mississippi. I undertake data analysis in Wide Orbit Media Sales, Comscore, Nielsen, Admall and TVB. There are lots of other resources to extract data from as well. I have just started here and love our team here. “The University of Mississippi has been a wonderful home for graduate students who have ambitions to pursue and valuable goals to achieve, which indicates precious efforts in grad school.